Get the Details on Drop Rates! When you complete a quest or fight a monster, often there's a chance for an item to drop as a reward. The engine works in mysterious ways, but this isn't one of them. Read on to learn about drop rates, how they work, and... a bit of math! Real life Luck (and the RNG) are at play. RNG stands for "random number generator." Each time the game checks to see if you should get a reward, a digital die is rolled and a number chosen. If that number meets certain criteria, you get the prize. Sometimes, you just have to be lucky. Drop rates are not cumulative. If an item has a drop rate of 0.5%, it does not mean that once you killed the monster it drops from 200 times, that you are guaranteed to get the drop. It means you have a 0.5% chance to get the drop each time you kill him. It’s like a 200 sided die. Just because you rolled a 10 this time, that didn’t remove the 10 from the die. You have a 1 in 200 chance to roll that 10 every single throw. Stack Limits + Drop rates. For quests where the rewards the “You will receive, at random” -type, there is one thing which will affect the drop rate. Example: the "Mine Crafting" quest. The quest drops 7 different metals as rewards. Each time you turn in the quest, each metal has a 1 in 7 chance to fall out... until you hit the stack limit for a given metal. After that, you cannot receive that metal anymore. So it becomes a 1 in 6 chance, and so on as you hit the stack limit for each metal. For quests where the rewards are “You may receive, at random,” we’re back to the 200 sided die. Each turn in has X% drop rate. There are many rumors about items or actions that can affect drop rates but... it just doesn’t happen. 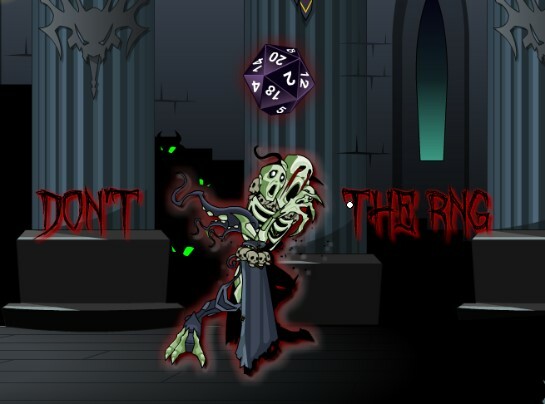 Using necromancer will not nerf the drop rates. Not using skills will not increase the drop rates. Someone else in the room having the item will not increase or decrease the rate. None of the common myths you have heard will affect drop rates. The drop rates are what they are. But X Item Won't Drop for Me! There is one thing which may interfere with items dropping (not drop RATES, just item dropping period): a stuffed cache! Not clearing your cache is responsible for more bugs, derps, burps, blerps and hiccups than anything else. If things are going wrong, the best first step you can take is to clear your cache first to see if that resolves it. Here is a handy-dandy Cache Guide if you need help with how to clear cache for your browser.